Michael is Entrepreneur in Residence at Blakes. He serves as champion for the Nitro program and helps to ensure that Nitro continues to deliver outstanding client service for emerging technology clients during the crucial early stages of development. In addition to his role with Blakes, Michael is the Co-Founder of BlueCat, which was sold to Madison Dearborn Partners, of Chicago, IL. He is a weekly business commentator on CBC, was a celebrated “Dragon” on CBC’s online Dragons’ Den and also is an investor on the hit podcast The Pitch . 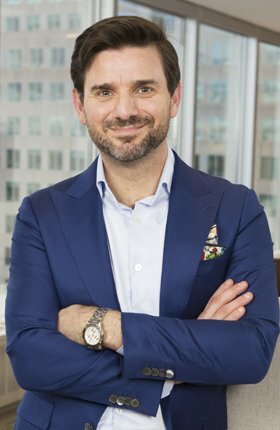 Michael is a Founding Partner and Fellow at the Rotman School of Management’s prestigious Creative Destruction Lab, and sits on the CEO Board of Advisors of Georgian Partners, one of Canada’s leading venture capital firms. He was a finalist for Ernst & Young’s Entrepreneur of the Year Award, and was a recipient of the Top 40 Under 40 award. Michael is also an active investor and philanthropist who chairs the Hyatt Family Foundation.